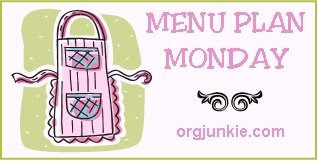 Check out more menu plan ideas at Org Junkie's Menu Plan Monday! Sounds like a good week of meals. On Tuesday, how bout pizza? Tuesday-how about some fried potatoes and hotdogs. YUMMY! Cheap, simple and yummy! I fry up sliced potatoes, onions and hotdogs in a pan! SOOO GOOD!